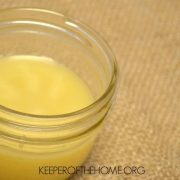 You are here: Home » Blog » Homemade & DIY » Make Your Own Chemical-Free Cleaning Products – Quick and Easy! 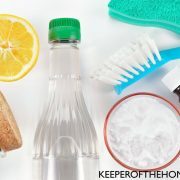 I love the idea of natural cleaners and I often make my own from vinegar, alcohol, baking soda, hydrogen peroxide, and sometimes essential oils. They do a great job of cleaning, but often leave behind unpleasant odors and streaks, especially on my glass. 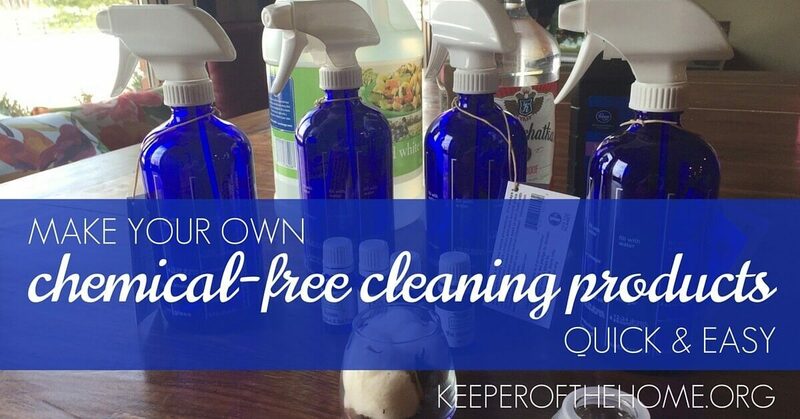 If I’m short of time and don’t remember which recipe is best for the particular surface that needs cleaning, then I automatically reach for my go -to, a chemical laden blue bottle that leaves a streak free shine….yes, you know what it is….shameful for a healthy living blogger, right? But it’s true, because it does such a great job! On everything! One of the fun perks of blogging is that every now and then you get a package in the mail with a new product to try and what to my surprise did I find in this package but my new go-to blue bottle! 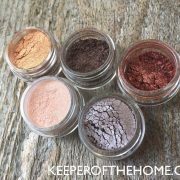 Cleaning Essentials is the creation of Mike and Martha, urban homesteaders living the small town life in upstate New York with two beautiful children and a backyard full of chickens. 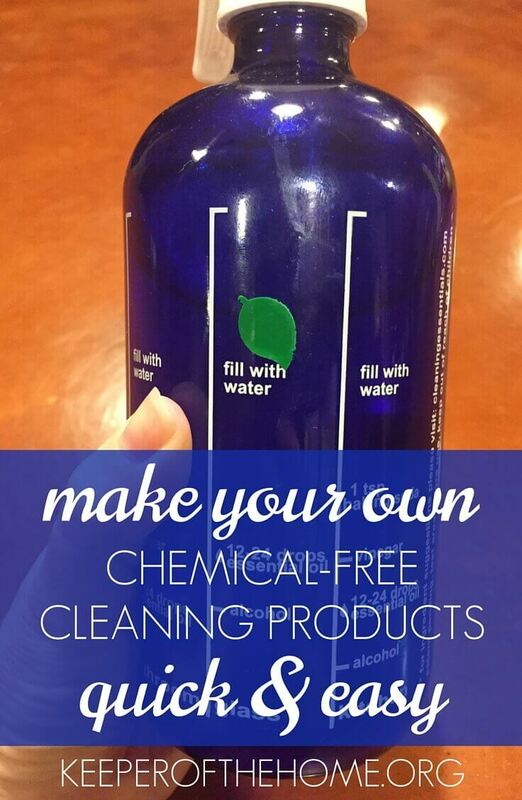 The company came about when Mike, who had been creating natural cleaners for years, and Martha, who wanted to use natural safe cleaners in her home, married their ideas with a blue glass bottle. Martha, just like you and I, wanted something for her home that was safe for the family, in line with their healthy lifestyle, easy to use, AND effective. are ridiculously hard to find. So here’s my review of Mike and Martha’s Cleaning Essentials and their gorgeous products (if I can say that about cleaning bottles). The first thing I noticed when I picked up one of these bottles was how heavy it was. I was a little unnerved at that moment, realizing that they were glass and wondering how my girls might do cleaning with them. My girls are teenagers, granted, not small children, but I was concerned. I immediately checked out their website and found this description about the bottles saying that even though they are glass, they are quite sturdy. If an accident should happen, you can take a picture, send it to them, and they will replace it. Plus, I know that plastic bottles leak more of those yucky chemicals into the cleaning products finding their way right onto the surface you are trying so hard to clean with natural non-chemical ingredients. The bottles are $14 each which seems a bit pricey, but when you take into account that you never have to buy them again, I think it’s totally worth it. The same is true with the sprayer, by the way: if it ever stops working properly, simply send it back and they will replace it, no charge. 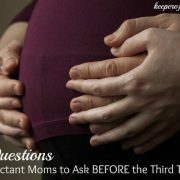 I won’t be letting any small children get a hold of these, because I would be too nervous, but the more I handle them, I can feel that they are pretty solid and I’m comfortable with my teen girls using them. After sorting through the idea of the bottles being glass I noticed the cool chart on the side of the bottle. 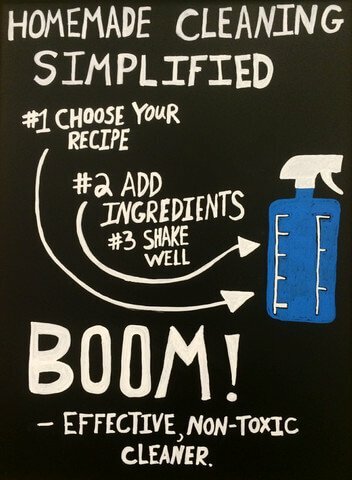 Very cleverly marked going up the side of each Cleaning Essential bottle are 5 recipes. Each one is for cleaning a different surface. No more searching for natural cleaning recipes for me! Above each recipe name are fill lines and the type of product needed for cleaning. 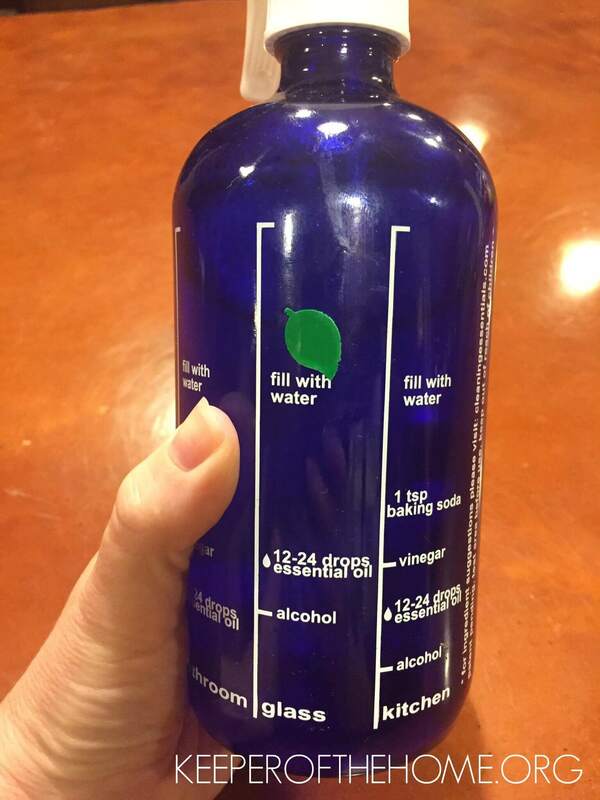 Don’t worry about forgetting which recipe you put in the bottle, because each bottle comes with a sticker to mark the recipe. No more guessing which ingredient is best for the kitchen or for my wooden tables. No more guessing how much vinegar, oil, or alcohol to add to the water! Mixing up natural cleaners just got super easy! 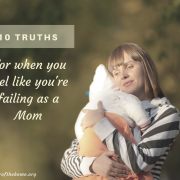 I don’t have any more excuses…. After opening the box and finding the contents, I immediately rounded up all of the needed ingredients from my kitchen and bathrooms and got to work filling all four bottles. I enjoyed the simple act of ‘fill to here’ and the fresh smells I deeply, without choking on harmful chemicals, inhaled. I would have to say yes, they were quite convincing! Completely alluring, actually. 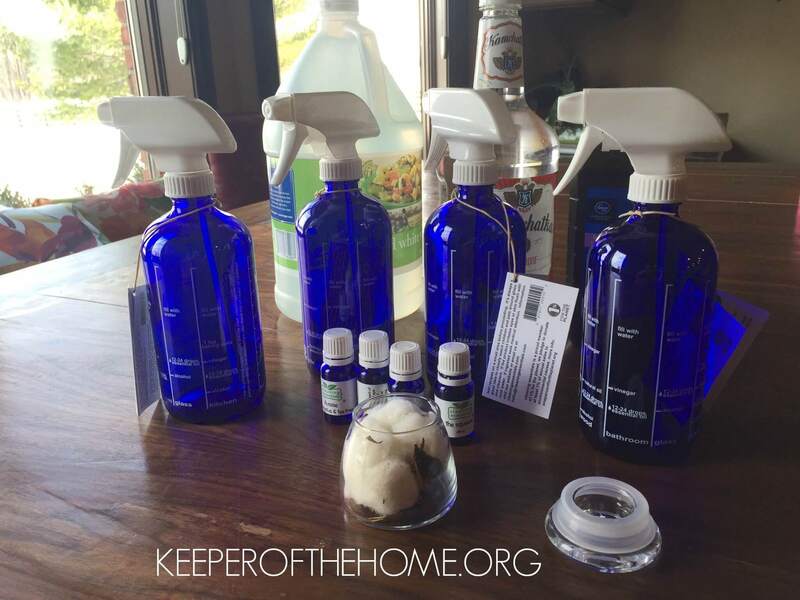 With the simple, easy method of filling the bottles and the wonderful scents that adorned my now clean house. Before reviewing Essential Cleaning bottles, I had never thought of making my own wood cleaner. I have used olive oil in a pinch before, but the recipe and essential oils blend that I used on my wood table today worked well and smelled way better! Surprisingly, even cleaning my glass table passed the test. On the Essential Cleaning site they recommend North Woods blend for glass and I was very pleased with the results. It was a streak-free shine! They are 100% pure essential oils and are sold for $7 each. 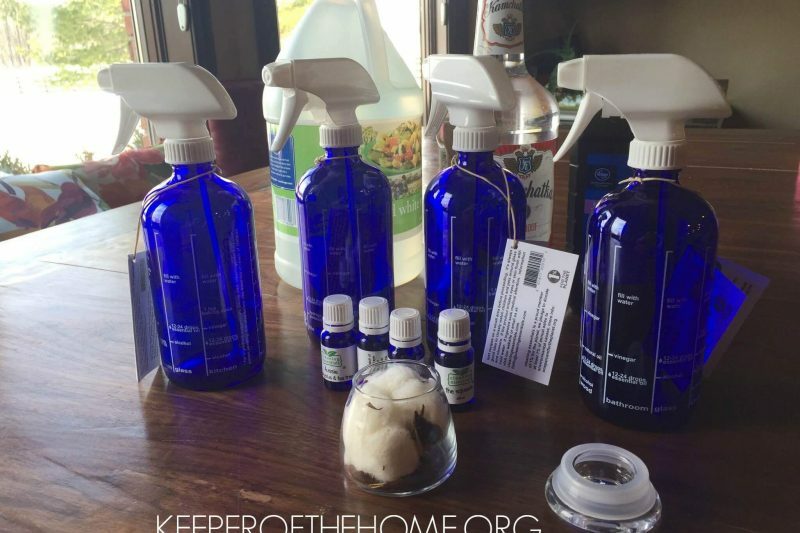 If you are looking for an easy way to begin cleaning your home with natural cleaners and tossing out the chemical store bought cleaners Cleaning Essentials may be for you. Mike and Martha invite you to explore their website and line of products…and I encourage you to do the same. They’re passionate about helping others to live a chemical-free lifestyle, and that’s something I’m on board with! What are your favorite non-chemical cleaners? Disclosure: I received free products in exchange for my honest review. What?! Oh my goodness. This sounds like an amazing idea!!! I’ve been replacing our household things with DIY safe and chemical free versions over the last couple of months experimenting with different recipes I’ve found online (so many!). Some have worked very well others just so-so and I just spent a few hours today researching and re-vamping some recipes. I wish I would have seen this post first! Lol. I’m curious, did the bathroom cleaner recipe from this company truly get rid of mold and mildew in showers?!?! That’s been the toughest thing for me with DIY household items so far. Also, how “vinegary” do these recipes smell? Unfortunately I’m ultra sensitive to the smell of all vinegar. Major gag reflex and another hurdle as I continue on my DIY mission. Thanks Ann. Worth a try for sure! Michelle I am not a fan of the vinegar smell at all. My first batch was a bit strong, but since you can adjust the essential oils to your own tastes, I noticed the batches after are better. Just a few more drops of the oil helps to lower the vinegar smell. Hope that helps! Hi, I’m still learning about EO’s for overall health. I have not purchased any but have read about some and been to one class. From your experience (and I know I can contact them at Cleaning Essentials), how are these different or the same as other EOs? I’ve been told that the FDA only requires for them to have at least 5% oils in order to call them 100% pure. And if it can’t be ingested, its more than likely not 100% pure, therefore it can cause other issues. Do you know the process these oils go through from plant to bottle? The $7 price tag seems great, but curious if something is lacking. Please don’t think I’m doubting! I’m just only trying to learn so I can start making healthier choices for my family! Thanks for your research though and I truly do love this idea! Now, we need these for our soaps, shampoos, and laundry!! Hi Shalimar, great question and thank you for asking. In my review I was focusing on the bottles so I did not do a thorough research on the oils. On their website they say that they are food grade, “Essential Oils are naturally occurring oils found in plants. 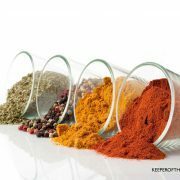 They are known for having a wonderful array of health benifits as well as antibacterial and antimicrobial power. Cleaning Essentials is very selective of the oils we offer, only sourcing 100% pure, natural, food-grade (when available) essential oils. All of our oils are either steam-distilled or cold pressed (citrus).” However, you may be wanting therapeutic grade for health and healing. I know how confusing the EO world can be and I completely understand your concern so if you have a company that you already use and trust, I would stick with them. I’m sure they have similar products. Hope this helps!